I am a die hard Traditionalist. Same. Same. Same. That's me! Hmm...maybe not. I guess I use Christmas to express my creativity?! So, which is your favorite? Do you do the same thing year after year? Or do you like to switch it up? I never know what I'm doing until I am doing it. We are just a bunch of overgrown kids at our house. Jan likes Peanuts and Snoopy, so every couple of years we do the whole tree in that. I like penguins, so we can do a tree in nothing but penguins too. Over the years we have been given favorite ornaments from friends and family, and of course Miss Maddie makes one or two every year, so this year was a favorites tree. You changed the color of your wall though! The flowers are fun! I try not to be the same but it gets too expensive to change all the time. I try and use what I have but always in a new place. I did a post yesterday of my Christmas. I hope you stop on by! My tree seems to look at least similar every year. I like deep cranberry reds, pearly whites and vintage silver/mercury glass. I use white on the tree too. It always gets a country victorian look...exactly what I like for the tree. Nothing in my house is victorian...but I always seem to go that way for my tree. I love for it to 'glow'.I do not use tinsel though, just vintage merc. glass beads and balls. I like them all. My tree tends to be similar (I always have glass blown icicles..can't help it I LOVE them) in the fact that I like it full and typically it will have white lights, with new and handmade ornaments. 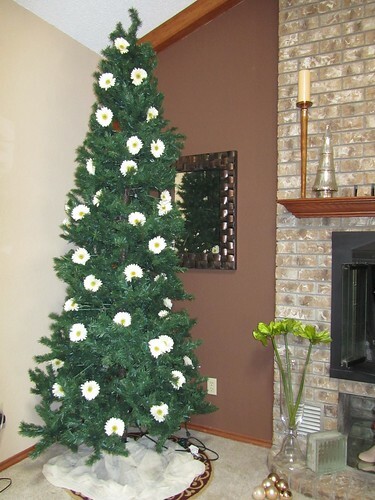 I usually will switch up the Christmas decor I put in other areas of my home. 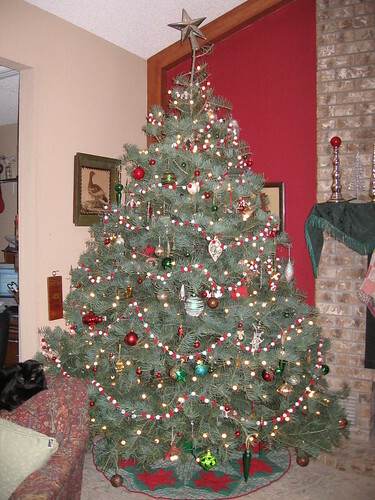 I like the 2009 tree! I do the same thing every year! I don't put up a tree at all! Lol! I just don't care for the holiday! I like to look at what other people do, but don't get into for myself! Yeah! I guess I'm a Christmas decorating scrooge! April, I think it's cool that with a child, y'all still switch it up. Seems so many folks grow their trees with ornaments their children make. I grew up in that house and loved the tradition of handmade ornaments! We were indie before indie was cool. Megan, did I mention I love your mantle? I'll share more of my house later. You are correct. My wall colors changed. I am still diggin' the brown. Tami, your tree sounds beautiful! And thank you for not mentioning the whole "light" fiasco. ugh. Ha! Susie, I am perusing for pics of the bird lights tomorrow. I wanna see it. Nope, not a Gemini. I am a quirky Libra. Crazy, huh? TOT, I recall knowing this about you. But, it surprises me. An excuse to decorate? Hello??? Have you met me? I've never met a Christmas tree I didn't like and I like all of yours! My philosophy for decorating the tree is simple...if I can see the branches...I need to add more! 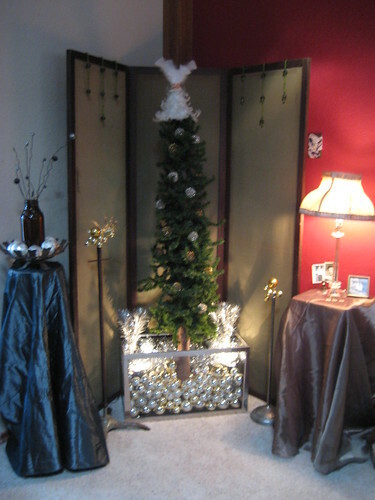 Mindy, I really liked your 2009 tree - very traditional and elegant. But this year's is simple, fun and a bit unconventional - I like it too! My tree always looks pretty much the same. It's a huge, wide 9 foot tree. I have a modge-podge of ornaments so I create little vignettes all over it. How fun to have a different look every year. i got stuck on the fish tank "stand" and didn't see another picture! that is too-too cute! i can't stand it! as someone i know and love woud say: HOLY COW! Love all your trees...but I love the aquarium base with silver balls. I do the red and green with ornies collected over the years, however I like to put up more than one tree, so I can play! But, with the tour coming Sat. my house is not "done up", yet! 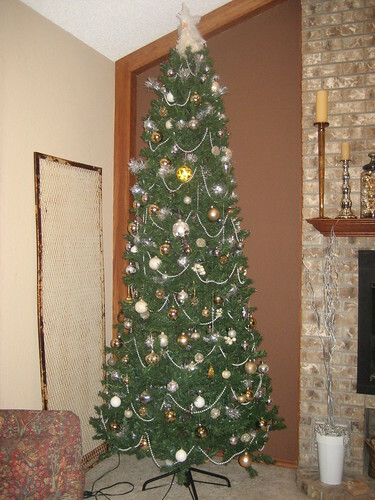 Okay - I like your 2010 tree!!! It's just quirky enough to be TOTALLY you!!! Compared to you, I have very boring trees. Shhhh...don't let me tree know I'm talking about her. She's sensitive.